Waiting for something worthwhile can be interminable, but when you finally get what you’re looking for, the payoff is all the better. As far as entertainment, there’s no finer example of this than Boardwalk Empire: The Complete First Season on DVD and Blu-ray. Atlantic City is the crown jewel of 1920 New Jersey and the ultimate tourist destination of the United States. Behind all the glitz and glamour of this coastal paradise is County Treasurer Enoch “Nucky” Thompson (Steve Buscemi), whose control over the city’s elected officials keeps things running smoothly hand in hand with dealings in the criminal underworld. As a wave of Prohibition fever sweeps over Nucky’s domain, he sees it as a way to increase his already considerable business holdings while still denouncing alcohol publicly and pandering to his constituency. But gangland operations aren’t what they used to be, and competing interests are starting to make themselves known. When Buscemi appeared on the fifth season of The Sopranos, we should have known it wouldn’t be the last time. Playing Tony Soprano’s hard-luck cousin may have gotten him primed for a mob role like this — Reservoir Dogs probably didn’t hurt either — but he gives us a performance that doesn’t feel like a rehashing of Don Corleone or Tony Montana. 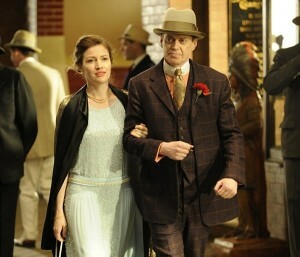 Nucky Thompson’s style is more political than criminal, corrupt to be sure, but as he works the strings as a puppet master would and keeps his coffers full, he’s never too far from the action of bootleggers and other disreputable sorts. Michael Pitt stands out as Nucky’s protégé, Jimmy Darmody, a war vet whose attempts to make good in life inevitably bring him back to the path for which he’s always been destined, naturally clashing with his boss when he starts to get too big for his britches and attracting the attention of the law. The consistently underrated Michael Shannon is forceful, to say the least, as a dogmatic federal agent hoping to bring down Nucky and his friends, taking each defeat more and more personally. Scottish actress Kelly Macdonald modulates her brogue ever so slightly to that of an Irish accent as Margaret Schroeder, the widowed single mother who unintentionally becomes Nucky’s kept woman, not realizing soon enough just why he’s taken such an interest in her instead of all the showgirls, flappers, and molls at his beck and call. Margaret’s involvement with the temperance and suffrage movements of the time period are woven flawlessly into the historical tapestry that covers the earliest days of the Roaring Twenties. Appearances by well-known mobsters like Arnold Rothstein and Lucky Luciano (Michael Stuhlbarg, Vincent Piazza) as Nucky’s opposition and Jimmy’s new pal, an ambitious little fellow by the name of Al Capone (Stephen Graham), give us an idea of just how big some of these rackets will be. Then again, if you want the factual breakdown, you can get it with the disc documentary The Original Sin City and the featurette Speakeasy Tour. More importantly, if you need everything all at once, and you happen to be watching on Blu-ray, get a wealth of information in the Enhanced Viewing style, complete with interviews from Atlantic City historians. More behind-the-scenes goodies give you an overview of how much work went into the elaborate recreation of the era, but just knowing that executive producer Martin Scorsese directed the first episode should be enough for most, while the myriad awards and nominations it’s received should convince the rest. The first season of Boardwalk Empire may have taken some time to compile on DVD, but the wait was more than worth it. With the run of the second season already wrapped with a third on the way from HBO, it’s going to be a tense time anticipating when we’ll have another collection to take home. Still, given all the materials in the DVD we have, there’s still plenty of time to truly finish your viewing experience. No point in getting too greedy, although it seems to work well for Nucky.